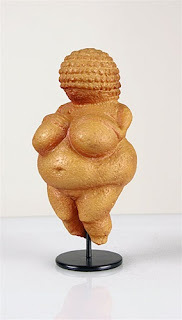 I Advocate Feminism ... a mini-blogzine: A different view of "The Willendorf Project"
Professor Louisa Ngote introduced me to the "Venus of Willendorf" back in the fall of 2010 in her Introduction to Western Art class at Oakland University in Rochester, Mich. So, of course I was excited to be able to make the ancient art connection in "The Willendorf Project," an "installation art project" currently on display through Feb. 18 at the River's Edge Gallery in Wyandotte, Mich. The exhibit is meant to be a critique of the diet industry and a statement about society's view of physical beauty. Artist Brenda Oelbaum uses donated diet books in the construction of her project, but it also features Oelbaum's replicas of the Venus of Willendorf. "I wish they would look at the original (above.) These modern images are a travesty of the original," Ngote told me via email. When I asked her to elaborate, she said: "I guess I don't like really nice art abused in such a fashion. I really don't think she (the Venus) should become a poster girl for obesity. I was also not very happy with the fake replica. You know the real figure so you can see how they've distorted it and totally lost any sense of the aesthetics and beauty found in the original." Professor Ngote is a special lecturer in art history at OU and has a master's degree from Wayne State University in Detroit. Although we don't know the exact purpose of the Venus figure, also called "figure of woman," it might have been to acknowledge and revere women's fertility and life-giving ability. Given this context, perhaps it would have been appropriate to include a different perspective/opinion of the project in the original article. It always pays to look deeper for a true feminist perspective. Want your own "Venus of Willendorf?" I like this one from emuseumstore.com for $34 plus shipping. Updated Feb. 25, 2010 to reflect the correct spelling of the artist's name. Have you seen the latest work by Brenda? She has an ad in the Globe and National Examiner (I saw them at Krogers this morning!) Also found out about a campaign she started (bit.ly/dietersunite) as the link was on the ad... such a coincidence to run across this blog entry! 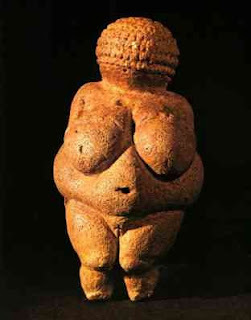 Just found this Cherie...I am in full agreement with your professor in regards to the use of the Venus of Willendorf in this way. Actually the whole project was inspired by a diet ad that used the the image of the Venus to say "you don't want to look like this" Well you might say that I am doing the same thing. But Actually I feel that I am taking the image back in a satirical way. More and more in this time when people are so concerned about Obesity images like this are appropriated from history and miss used. I hope that my use of the image will actually help bring her back as a rallying cry for women, not a way of making women feel poorly about themselves.